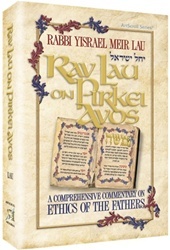 Running the gamut of Mishnah commentary, history, inspiration and anecdote, Rav Lau on Pirkei Avos is a rich, elegant, authoritative presentation that will both delight and enlighten-there is nothing like it. Now, beautifully rendered by Yaakov Dovid Shulman, volume 1 of Rabbi Lau's magnum opus - covering the first two chapters of Avos - is available in English. The next two volumes to complete the set are now in preparation.